Russia Revisited 09 - SeattleCoach! "Connection. Curiosity. Challenge." Autumn 2009. This is a time when a lot of us think about what comes next--of what we want to create, invent, launch or instigate. I know it's a theme I share with my favorite clients: Always thinking about where the next place is to grow and learn and course-correct. Here's a goal that's got me all excited this month. A little background: It's been twenty years since the fall of the Berlin Wall in November 1989. 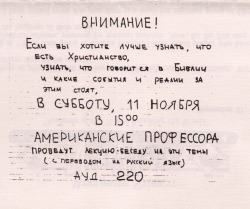 I was working at the time with students at the University of Leningrad when one of them, Andrei, ran up to me on Thursday, November 9 to tell me the news he'd heard on the BBC, "Patricia, have you heard?! The Wall in Berlin has come down!" Now, I'm a natural optimist, but after years of travel to and hassle from the former Soviet Union, I smiled condescendingly at Andrei, just not believing his English was that good bless-his-heart. But he was right. By the next day, the whole world felt different. 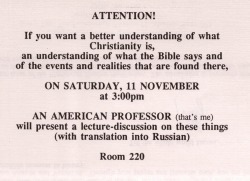 I was scheduled to speak that Saturday at the University of Leningrad, and instead of a dozen brave souls, 100-200 students crowded together to listen to me talk about faith and history and the human possibilities that come with the gift of freedom. So, fast-forward to a few weeks ago. I think, I've got to go back. I called my favorite traveling companion from those days, a comedienne named Mary (never visit a police state without one) and proposed a quick trip in November 2009. She instantly agreed and we are in the process of working through the required Russian red-tape (some things never change). You know how some goals become engines that energize other goals? I think this trip is one of those. I'll be blogging and twittering about the lessons and adventures and laughter that will accompany this trip. Sign up here to follow our progress. Click here to read something about my big takeaways! 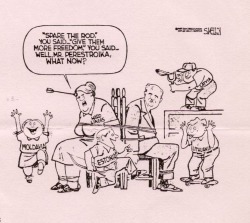 The cartoon below is from 1989 in Newsweek, featuring President Gorbachev. It still makes me smile.